Due to the level of detail, maps are best viewed on a tablet. Controversial and revisionist history of America's first civil war. Published with hugely successful accompanying four-part BBC TV series -- written and presented by star military historian, Richard Holmes. Most people view the American Revolutionary War of the 1775--83 (also known as the War of Independence) as a popular struggle for liberty against an oppressive colonial power. 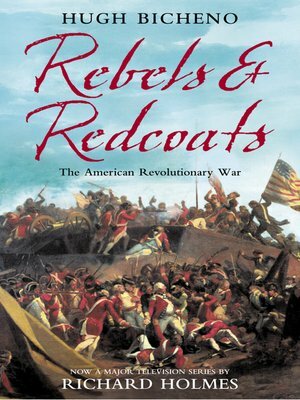 REBELS & REDCOATS by historian Hugh Bicheno, written to accompany a four-part BBC television series presented by Richard Holmes, demonstrates that it was in fact America's first civil war. Employing the latest scholarship and vivid eyewitness accounts, Bicheno argues t that the war was the product of a broad French imperial design, and greed of many prominent colonials. As many Americans remained loyal to the Crown as rebelled against it, and the reasons for adopting or changing sides were as varied as the men and women who had to make the unenviable decision. Native and African Americans overwhelmingly favoured the British cause.We hear not only the voices of Rebels and Redcoats, but also of German mercenaries and aristocratic French adventurers, as well as Indian warriors and Black slaves fighting for their independence, which together shed new light on events that forged a nation. The main loser was the French monarchy, which ruined itself to gain no lasting influence over the United States, while unable to exploit the distraction the war created either to invade Britain or gain control of the West Indies, which at the time were considered a far bigger prize than all of North America.